* Cotonsport FC always seems to produce exciting attackers and any ambitious European club should consider checking out their current attacking line-up. When Cotonsport FC won 4-0 against Ngaoundéré University FC on 22.05.2011, wonderboy Jacques Haman (born 30.08.1994) and the powerful Hilaire Momi (born 16.03.1990) from the Central African Republic scored one goal each, while the exciting Ewangue Mbongo (born 13.03.1993) scored twice. Winger Edgard Salli (born 17.08.1992), the best player of the Orange African Youth Championship, was yet again pulling the strings and was very much involved in the victory. I strongly doubt these four players will play for Cotonsport FC next season. Especially Salli has been linked to several clubs lately, while Momi looks almost certain to leave the club this summer. I have no doubt that Momi have the qualities to succeed in a European league. Ngako Deutchoua was a rather surprising inclusion from my point of view. However, the experienced winger has been brilliant for Sable FC all season and has been impressing with his speed and aggressive style of play. Abouna Ndzana has been part of the Cameroon national football team at several occasions and is obviously ready for a professional league. The hard-working Ndame Ndame is a very strong player and one of the very best midfielders in the MTN Elite One 2010-2011. * There are several unknown players in the MTN Elite One 2010-2011 who are currently in great form. Watch out for Patrick Gabriel Naï Tako, mostly referred to as Patrick Naï, the current top scorer of Scorpion de Bé. Naï has scored five goals for the newcomers this season, and four of these goals during the last eight matches. Naï is a striker but other information is hard to find. Another exciting player is Clovis Ngalame of Tiko United FC. The attacking midfielder was signed from a club called FC Bamenda, apparently some kind of academy, a few months ago and Ngalame is already established member of the team. In February 2011, Ngalame scored for Tiko United FC in the Orange CAF Confederations Cup against DFC 8e Arrondissement. Ngalame was part of the Cameroon U-20 national football team in November 2011. Franck Olivier Zibi – goalkeeper at Sable FC who has been impressive for the last couple of months, taking the place of Thierry Tangouatio of the Cameroon U-20 national football team. Ibrahim Walidjo – arguably the best defender at Renaissance FC. Jean-Paul Ekane Ngah – regular right-back at Ngaoundéré University FC, born 28.08.1989. Charles Lobe Lembe – central defender at Unisport FC. Lobe Lembe is born 15.07.1987 according to the official homepage of Unisport FC. Jacques Bertin Nguemaleu – central defender and captain of Union de Douala. Camille Kamdem – attacking midfielder at Renaissance FC. Alex Ngamou – attacker or winger at Unisport FC, born 15.01.1990. One league goal so far this season. However, it was interesting to see that two of the players I have written about were included in the squad: Maxime Mengue (born 14.04.1992), the central defender of Canon de Yaoundé and Clarence Bitang, the attacking midfielder of Astres de Douala. * Livercamerfoot is one of the best Cameroonian football pages on the web. The page recently published 30 candidates for their “Golden ball”-award. I personally find the list very interesting, as it says a lot about which players that have been standing out this season. Nack Balokog – Cotonsport FC – defender or defensive midfielder – born 10.09.1986. Hugo Nyamé – Astres de Douala – goalkeeper, born 13.04.1986. Somewhat surprising that Nyamé was listed because Lawrence Ngome (born 23.02.1979) has played more matches in the number one shirt of Astres. Geremi Sagong – Astres de Douala – hard-tackling central defender, born 20.07.1986. Joseph Julien Momasso – Astres de Douala – left-winger and top scorer at Astres, six league goals so far. Philippe Ebonde Ebongue – Astres de Douala – highly regarded striker, born 27.10.1987. He is probably not happy with the four goals he has scored so far this season. The picture is of Ebonde Ebongue and is taken from Le Chabba. Thierry Tonye Biheng – Unisport FC – central defender, born 24.10.1987. Marcellin Gaha Djiadeu – Unisport FC – experienced central defender, born 24.03.1982. Adamou Garba – Unisport FC – lively attacker from Benin. A somewhat surprising inclusion, because he has yet to score this season and he has only played about half the league matches this season. Gustave Moundi – Union de Douala – defender / midfielder, born 16.02.1985. Gérard Bakinde Bilong – Union de Douala – the midfielder is one of the revelations of the season, signed from second level club APEJES FC de Mfou before the season. Alain Tekeu Tchoumte – Panthère Sportive – eccentric and brilliant goalkeeper. Isaac Tatchoum – Panthère Sportive – experienced midfielder born 29.08.1982. Often captain of the team. Junior Lohis Itondo Djoky – Canon de Yaoundé – regular goalkeeper at Canon. Robert Ntolla Nguena – Canon de Yaoundé – central defender and captain of Canon, born 16.04.1985. Alain Assana – Ngaoundéré University FC – midfield general and the undisputed leader at Ngaoundéré University FC, born 17.01.1986. Rostand Youthe Jehu – Union de Douala – regular goalkeeper at Union, born 23.12.1985. 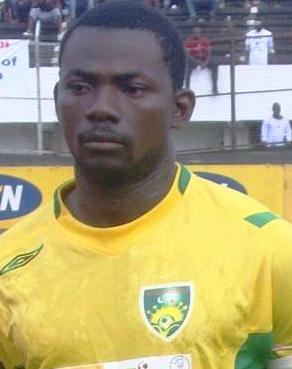 Thierry Makon Nloga – Caïman de Douala – key midfielder at Caïman, born 09.10.1983. Almost ever present this season. Yazid Atouba Emane – Canon de Yaoundé – attacking midfielder, born 02.01.1993. Member of the Cameroon U-20 national football team. I think Hilaire Momi of Cotonsport scored the most goals with 16 goals. I think Jean Francis Dipita Ebelle of Caiman scored 8 goals and i think Patrick Naï of Scorpion and Joseph Julien Momasso of Astres scored 7 goals. However, I lack details of all scorers so this is not necessarily 100 percent correct. who are the 1st,2nd and 3rd highest goal scorers in Cameroon MTN Elite 1 for season 2010-2011?